Hello from Faith over at Fresh Lemons Quilts! The holiday season is just around the corner, and each year I am eager to create handmade decor for my home. In the past I’ve sewn an advent calendar, Christmas tree skirt, and many quilts. This year I am excited to share a new pattern for a holiday inspired table runner. Over the next four weeks, we will be piecing 4 modern-traditional holiday block designs. 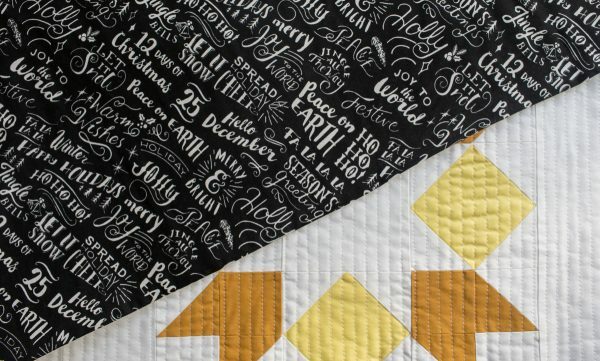 These blocks are a mix of foundation paper piecing and traditional piecing. If you have never foundation paper pieced before, don’t worry! It is easier than it looks and I will provide step by step photo instructions for you. If you would like to start practicing the technique ahead of time, check out this tutorial on my Fresh Lemons Quilts blog. All the blocks finish at 12″ x 12″ squares. Some individual blocks will appear off-centered prior to their placement in the final table runner. This is by design to achieve a beautiful balance in the final layout. Alternatively, individual block patterns can be used as bee blocks or to create a quilt top, place mat, mini wall hanging, or even mug rug. 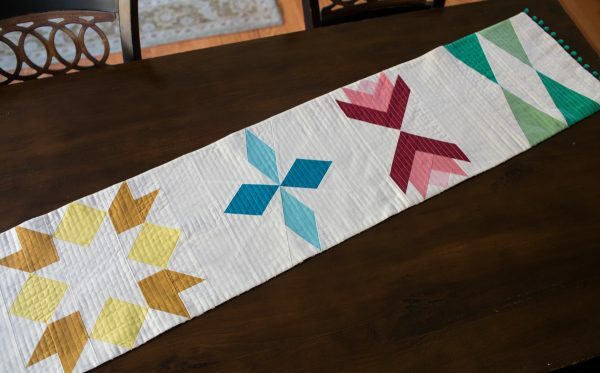 I hope this table runner can be a jumping off point for many creative projects in your home. 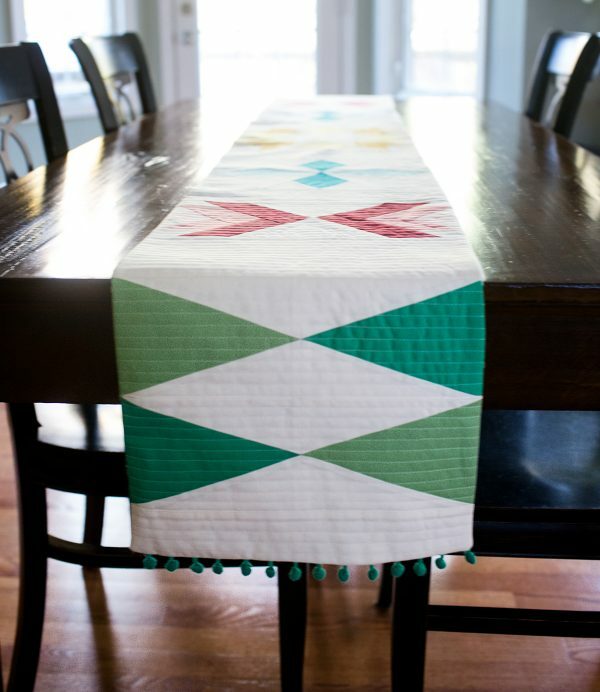 * Depending on the size of your table, you may want to lengthen or shorten this table runner. My table is 64″ long. This pattern allows a 10” drop on each end of my table. 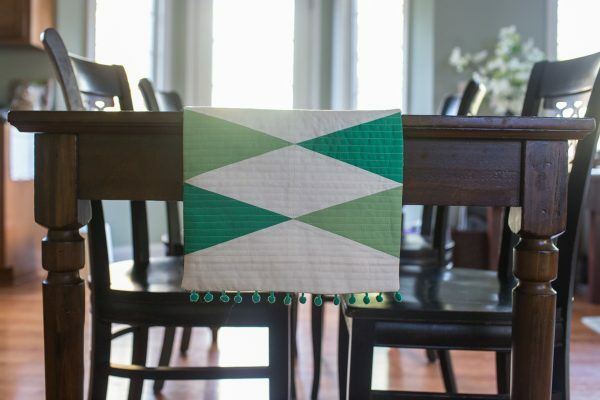 To shorten your table runner, remove blocks in the design. To lengthen your table runner, add additional blocks in the design, or add equal sections of background fabric between your blocks. The Sugarplum Table Runner is a mix of bright and white solids. Some of the colors required for this project take very little fabric. This is a perfect project for scrap busting! However, if you’d like to make your table runner exactly like mine, I’ve listed the Robert Kaufman Kona Cotton Solids I used. I would suggest buying a fat eighth of each and you will have fabric left over. This week I am presenting the cutting instructions for the blocks we will be making over the month. 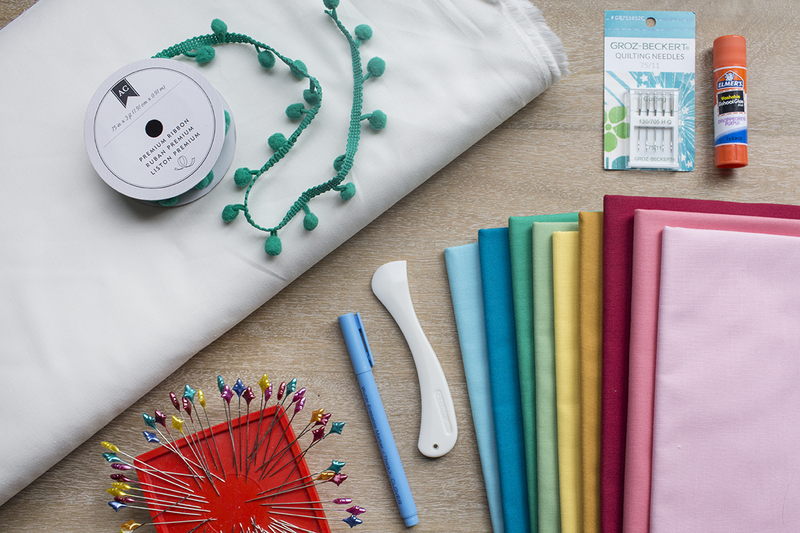 Feel free to cut your fabric now, or wait to cut your fabric per block as we make them. Blocks 1, 2 and 3 are Foundation Paper Pieced. When cutting fabric for this technique, you will be using fabric pieces slightly larger than the shape you are covering. I have sized the below cuts to be beginner friendly, but feel free to cut your fabric larger or smaller as desired if that works better for your sewing style. Next week join me as we begin piecing our quilt blocks. First up will be the Modern Pine Trees and Poinsettia Flowers quilt blocks. See you then! Next Next post: Mend your Jeans! This is gorgeous! Definitely going to be doing this along with you!